A beautifully realized, intelligent story that successfully marries the messy histories of contemporary Iran and a teen-age girl. When we meet Marjane Satrapi early on in the animated autobiographical feature Persepolis, we know the rambunctious 10-year-old girl living in Tehran in 1978 is headed for a troubled adolescence. There's the impending overthrow of the Shah; the prolonged and futile Iran-Iraq war; and the enforced social restrictions in the wake of the 1979 Islamic revolution. Hardly a supportive environment for a bright, sassy girl whose goal is to become a kung-fu film star and a future prophet. Indeed, Satrapi's youth was marked with disappointment, confusion and anger, all of which she later chronicled in two graphic novels originally published in France, where she now lives. Now, Satrapi, along with her creative partner Vincent Paronnaud, has adapted her novels for the screen; the pair share screenwriting and directing credits. Young Marjane is an indulged only child, the progeny of educated, Westernized parents who don't support the corrupt Shah. But the revolution, once viewed with excitement and hope, only brings the Satrapi family fear and tragedy. As Iraqi bombs continue to fall in Tehran and Marjane's lively spirit is cloaked in the now-mandatory veil, the decision is made to send the rebellious teen-ager to safety, to a French school in Vienna. But Austria proves no promised land: With no family or community, Marjane drifts. Though she finds renewed personal freedom and some solace among bohos, she's frequently plagued with survivor's guilt, and pines for her family and homeland. The relocation has left her suspended between two worlds, with little cohesive identity. Yet, a move back to repressive Iran as a young woman to attend college only sparks another tailspin of depression and frustration. 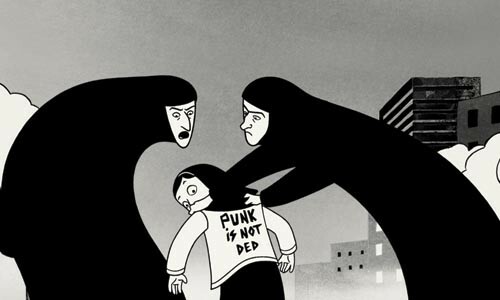 As a coming-of-age narrative and personal window into a tumultuous history, Persepolis offers a strong female perspective, rich with insight, candor and wit, less often explored in cinema. Persepolis gives voice to and humanizes those women we never truly see, hidden away beneath long dark robes. The contrast between private and public spaces in Persepolis is acute. In living rooms, we encounter smart, funny women, punctuating their conversations with animated faces and lively gestures; in the streets, they transform into fearful, meek indistinguishable shapes. Rendered almost entirely in black-and-white animation, Persepolis brilliantly retains the stylized nature of the graphic novel. The illustrations are deceptively simple, yet consistently evocative. For instance, Satrapi chooses to depict the confusion and horror of the revolution in stark silhouettes that are nonetheless deeply affecting: When a pair of white eyes, striking in a sea of blackness, blink shut, it's a simple but vividly rendered death. Perhaps it was the small-scale, snapshot format of the graphic novel that trained Satrapi to the powerful economy of tiny vignettes, of which the film has many: During wartime, the still-exuberant Marjane rides a shopping cart through a store with more empty shelves than goods; older women, draped in chadors and resembling hooded cobras, loom malevolently over the still-Westernized Marjane; and the twice-told explanation of her grandmother's fragrant undergarments illustrates both the sweetness of their familial bond and its heartbreaking rending. The legendary French actress Catherine Deneuve voices Mrs. Satrapi, while Deneuve's own daughter, Chiara Mastroianni, speaks for the teen-age and adult Marjane; Gabrielle Lopes gives the child Marjane voice, and Danielle Darrieux brings Marjane's no-nonsense granny to life. This beautifully realized, intelligent story, which successfully marries the messy histories of contemporary Iran and a teen-age girl, is currently nominated for an Oscar, but not as a foreign film. Instead, and somewhat bizarrely, Persepolis is entered in the new animated-film category, where it will compete against a rat that cooks and a penguin that surfs. Persepolis always forefronts Marjane's dedication to preserving who she is, her rich history and her potential, even if the costs wrought are terribly bitter. Thus, even as Marjane is inspirational in a warts-and-all fashion, Persepolis is also a terribly sad story about the sacrifices made by Marjane and her family for freedoms we take for granted. Ultimately, Marjane has no home to return to. Like Persepolis, Persia's ancient capital which lies now in ruins, her formative world with its lively culture, personal histories and exciting future, has been destroyed by a restrictive ideology that bars her full participation. But the film's bookends, set in Paris in 1994, literally let some color into the anguished monochrome of Marjane's story. And if Marjane didn't quite become a kung-fu movie hero or a prophet, she now has a starring presence in a film that presents her powerful personal history with explicit cautionary overtones. 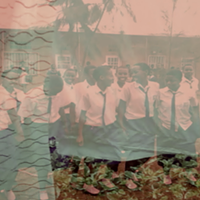 It's no surprise that such a strong-willed little girl managed to wrest some version of her dreams from the clutches of oppression. In French, with subtitles. Marjane fends off an attack of chadors in the streets of Tehran.